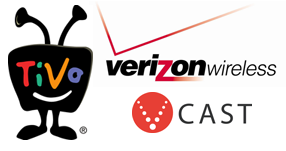 TiVo previously made deals with Yahoo!, which allows scheduling shows right from Yahoo TV (tv.yahoo.com). With TiVo Mobile, members can schedule shows on-the-go right from their cell phones and even watch them once they have been recorded. Verizon customers can begin to download the program in early summer through Verizon’s “Get It Now”. Pricing has not been announced, but should be soon.